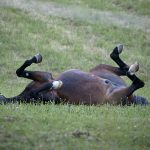 We’ve all heard the saying “no foot, no horse” but what can we do as horse owners to make sure our horses have the best feet possible? The first, most critical step is routine hoof care. Like our fingernails, horse’s hooves are continually growing. Trimming the hooves every 6-8 weeks is necessary to keep the horse’s hoof balanced with hoof walls perpendicular to the ground and heels appropriately set under the horse’s lower limb. As the time period between trimming/shoeing appointments increases, the hoof walls begin to chip and splay and the heels can become underrun. 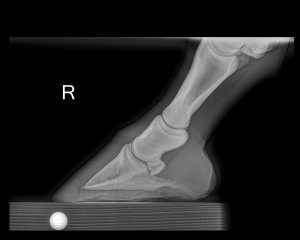 These changes compromise the structural integrity of the hoof wall and are detrimental to the mechanics of the foot. Most horses only require basic trimming and/or shoeing to retain a healthy, sound hoof, but, there are a multitude of specialty cases where additional therapeutic shoeing techniques can be applied to improve both the soundness and the function of the hoof. 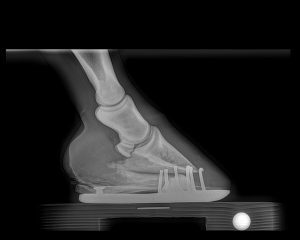 Laminitis, a club foot, low heels, caudal heel pain, hoof injuries, angular limb deformities and soft tissue injuries can all benefit from a customized shoeing program. Let’s take laminitis for example. 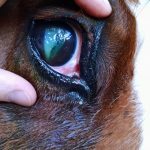 Rarely is there a disease process that frustrates veterinarians and farriers more than laminitis. With a multitude of contributing factors, coupled with varying degrees of severity and deterioration within the foot, there is never just one guaranteed successful approach to shoeing these horses. In these cases, (and all specialty cases), radiographs are the key. 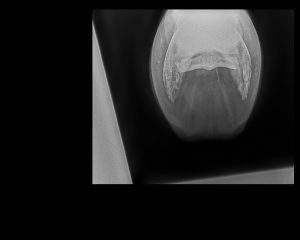 By determining the degree of rotation of the coffin bone within the hoof capsule, as well as the presence of any sinking and medial to lateral imbalance, a radiograph can not only help guide the farrier’s decisions, but also helps establish a prognosis for the case. 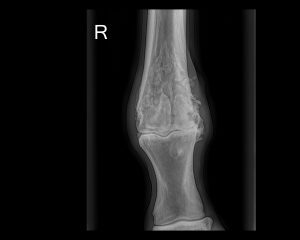 We’ve all heard the dreaded diagnosis of navicular disease, but overall, I think the veterinary profession has done a poor job of educating horse owners about what that truly means. 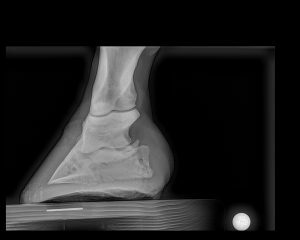 The term “navicular disease” doesn’t accurately describe the multitude of disease processes that could be contributing to a horse’s lameness. Not only is there the navicular bone to consider, but there is also the deep digital flexor tendon as it passes over the navicular bone on its way to insert on the underside of the coffin bone. 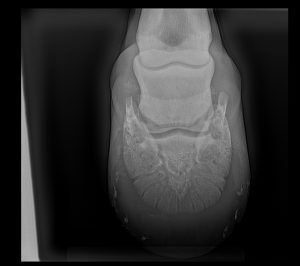 We must also assess the suspensory ligaments of the navicular bone, which help to keep the bone in position at the back of the distal limb, as well as the distal sesamoidian impar ligament that attaches the navicular bone to the back of the coffin bone. Also at play in this region are the navicular bursa and the coffin joint. 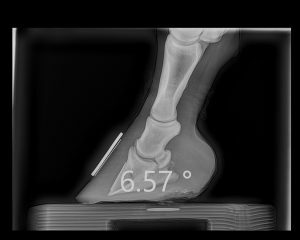 Before the use of MRI and CT, our main means of diagnosing any pain isolated to the heels of the horse was via radiographs. But what if the lameness is coming from the soft tissue structures supporting the navicular bone, and not the bone itself? 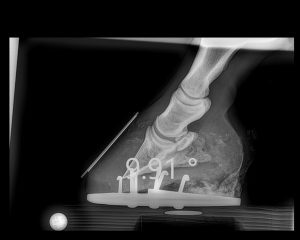 Radiographs aren’t always helpful in diagnosing such changes, and often, ultrasound cannot penetrate through the hoof capsule. This is where MRI and CT have widened our understanding of the navicular apparatus and broadened our term associated with navicular disease to Caudal Heel Pain. Based on type and severity of the injury, the shoeing changes can vary drastically to meet the needs of the horse. 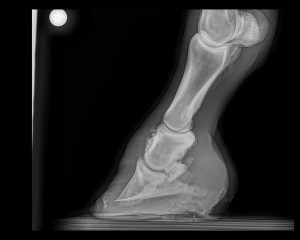 The applications for equine podiatry are vast and numerous, but thankfully the basic goals associated with equine locomotion and the biomechanics of the foot remain constant. 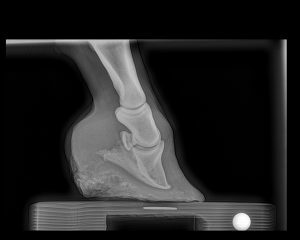 From sound, upper level athletes to horses with soft tissue injuries and osteoarthritis, an informed assessment of the equine foot can almost always improve the situation at hand.